Enjoy a FREE round-trip shuttle from the 50 Acres Campground to the Sonoma Plaza including a stop at Cornerstone Gardens. The shuttles will depart from the raceway on the hour beginning at 10 a.m. each day from Gate 6 near the 50 Acres campground. The shuttle will depart the Sonoma Plaza on the half hour with a final departure at 9:30 p.m. each night. 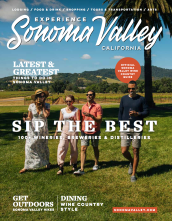 Feel free to explore the best of Sonoma’s wine country shops, wineries and restaurants without the hassle of driving.